Prominent & Leading Manufacturer from Mumbai, we offer Real Time Timer, World Time Clock, Timer with Counter, Square Root Timer, Charger Timer with Data Logging and Cyclic Timer. Ajinkya Electronic Systems are one of leading manufacturer,exporter, supplier of Real Time Timer. 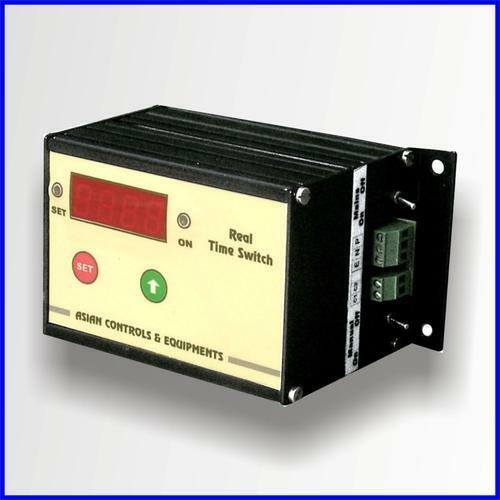 Our range of comprehensive Real Time Timer switch can be used to switch electrical such as street lamps, garden lights, corridor lights, neon signs etc. as per the time set. The timer has built in almanac timings fixed in nonvolatile RAM so that the user does not have to program the unit every day. Timer offers two outputs to drive contractors of diverse ratings. To achieve desired output these outputs are used with different combination. Timer is provided with manual override facility and optional detachable external keyboard unit that avoids unauthorized access. Ajinkya Electronic Systems also manufactures world time clock. These clocks are also known as, digital world clock, real world clock, modern world clock, global clock, office clock, time piece, time zone clock, world clock, world time, desktop clock, digital timer, digital clock, etc. These world time clock features a list of some of the largest, more well-known, and most visited cities in the world. Here, you can view time-zone information, and current time of a select group of cities. World time displays current local time in any place around the world. World time clock is an indispensable utility for everyone who deals with people abroad or anybody who is keen on knowing what time it is further than locally. These world time clock are specially designed for businesses which are located in different time zones and want to know current local time of their partners and customers. Globally presence customer worldwide, and looks more attractive & eye catching clock then older designed clocks. Ajinkya Electronic Systems are also engaged in manufacturing wide range of Timers with counter. Ajinkya IM1700 Series has variety of timers for On Delay, Off Delay, Cyclic, Sequential, One shot applications. All timers are microcontroller based with highest Crystal based accuracy offering more features, ease of use and versatility compared to electro mechanical or digital timers. They are far more superior and can be adapted to variety of user applications perfectly. These Timer with counter are used for industrial process control systems to monitor the count of process and also are pre-programmable. Ajinkya Electronic Systems have designed square root timer. These timers are manufactured under professional experienced technical team. We are well known for quality products in our rich industry. Our Square root timers manages to maintain on/off sequential timing in any industrial process systems. Ajinkya Electronic Systems are also engaged in offering charger timer with data logging option. This timer has the option of logging battery voltage and current and test report can also be instantaneously generated as it can be connected to a PC. Ajinkya Electronic Systems manufactures cyclic timer, it enables control of systems for various cycle such as on/off cycle sequence etc.